The content (text, figures, tables and layout) of this page is still in the process of being copied from the original publication. Please stick with us while we're banging away at our keyboards. Reversal Theory, June 21-25, 1991 at Kansas City, Missouri, U.S.A.
5.8 4.8. Pleasant and unpleasant results, necessary and sufficient conditions, acceptance of chances of mistakes and cognitive "bias"
This report describes a Cognition-Energy-Learning model which is based on several psychological theories. This model is general in the sense that it alleges to describe a variety of behaviour, insights and ex­periences which are generally regarded as distinct areas. Examples are: emotions, motivation, cognitive representa­tion of experiences, coping behaviour and the ethological concept of the efficient allocation of energy. The importance of this model lies, therefore, firstly in the opportuni­ty it gives to classify all those different psychological phenomena in a logically coherent and consistent way. In addition, the model provides an ex­planation of learning behaviour, as it goes back to the evolutionary basis of behaviour. In other words: it is possible to indicate why effective coping behaviour develops and moreover, why this development may stagnate. Coping means here: behaviour that is geared to mastering a problematic situation. Subsequently, the model explains on the one hand the con­nection between emotions and motivation and on the other, the way in which the cognitive representation of ex­periences is effectuated and how it changes. In each chapter of this report, one theoretic ap­proach of a specific phenomenon will be discussed and any lacunae, gaps or specific problems of the theory concerned, will be identified. We shall then attempt to solve these problems in the next chapter in which an additional piece of theory will be added. In this way four theories will be discussed, all of which show gaps in some specific respects. The basis of this thesis is Lazarus' theory. According to Lazarus (in Bond and Rosen, 1980), stress arises when a person notices that environmental requirements demand too much of his/her available resources. Lazarus states that stress situations do not necessarily have to be experienced as negative. It is, however, often be the case; when a person expects that his or her abilities and resources for dealing with specific environmental requirements are insuffi­cient, he or she will probably expect damage or loss. Such situations may be experienced as extremely threaten­ing. On the other hand, great demand may be made on a person in terms of adaptibility while that person still thinks he or she can handle the situation well. Such situations might be regarded as challenges, providing the opportunity to gain advantages, control or to effect personal growth. Adequate reactions in such situations may then influence that person's well-being very positively. Thus, stress situations are not always experienced as negative, but depend on the inter­pretation by the person in question. When a person experiences stress, he or she may develop strategies to limit damage, or even profit from the situation. In literature this is called coping. With regard to the inter­pretation of stress situations, Lazarus (1980) states that it is a problem that too little is known about which situations are felt to be threatening or challenging, when and by whom. This gap can be filled by Apter's Reversal theory (chapter 2). In this theory two so-called meta-motivational states are discussed. These metamotivational states determine how a person perceives a specific situation and the type of behaviour with which he of she will react to it. However, one disadvantage of Apter's theory is its descriptive nature and the fact that it does not account for a connection between the dynamics of motivation and the learning processes mentioned above. Van der Molen's learning model, described in chapter 3, does find this connection and is thus able to explain how these learning processes are maintained. In this model the "contagious nature" of learning ex­periences is described too, that is, a learning experience that is badly dealt with increases the likelihood that future learning experiences in similar areas of experience will also be badly dealt with which means that it is likely that the area concerned will always be proble­matical. (the reverse applies to learning experiences which are dealt with successfully). The cognitive interpretation or "labelling" of similar areas of experience (for example "exci­ting" or "boring") always depends on a person's metamotivational condition. Van der Molen's model describes how metamotivational conditions affect learning pro­cesses. The model does not, however, adequately describe how these conditions influence cognitive contents. Lewicka's model of antagonistic cognitive styles (chapter 4) does discuss this aspect. In this model two mechanisms are described which are alternately active in a person (comparable to Apter's theory). Which of the two mechanisms is active at a specific moment, determines what type of infor­mation a person will seek in the first place and also determines how cognitive information will be structured. By combining and integrating the theories mentioned (chapter 5) we have been able to develop a model that not only explains the growth of coping strategies, but also explains the relation between the dynamics of emotions and motivation on the one hand and the way in which cognitive contents are effected and grow on the other hand. We have called this model the Cognition-Energy-Learning Model (CEL). This will be exemplified with empirical information about the coping behaviour of teachers (Romkes, 1988, chapter 6). In this chapter Lazarus' theory (e.g. 1980, 1984) of coping behaviour is discussed. The most important ideas of this theory are summarized and at the end of the chapter we show that the theory contains a number of gaps with regard to the process of learning and the development of coping skills. Lazarus (in Bond and Rosen,1980) calls his approach to stress and coping behaviour cognitive-phenomenological. Emotions and stress are regarded as products of cognitive activity, relating to the way in which a person assesses and evaluates his or her relation with the environment. Lazarus emphasizes that there is a continuous relationship between persons and their environment. On the one hand there are people with individual values, beliefs, skills, etc. On the other hand there are situations, with varying requirements, limi­tations and facilities. Together they form a dynamic system in which there is a continuous process of mutual influence and change. Lazarus states that there is a transaction between persons and their environment which changes (adapts / trans­forms) constantly in the course of time. damage/loss; for example when a partner dies, loss of physical functions, loss of self-respect. threat; expected or feared damage or loss which has not yet materialized. challenge; growth opportunity, acquisition of control or advantage. "A working hypothesis about the causal antecedents of threat and challenge is that the former is more likely when a person assumes that the specific environment is hostile and dangerous and that he or she lacks the resources for mastering it, while challenge arises when the environmental demands are seen as difficult, but not impossible to manage, and that drawing upon existing or acquired skills offers a genuine prospect for mastery." (in Bond and Rosen, 1980, p. 48). This leads us to the second type of transaction assessment. The above quotation not only discusses appraisal of the situation and environmental demands, but also appraisal of a person's own possibilities to react adequately. Lazarus calls this secondary appraisal, i.e. appraisal of the personal and social means a person has at his or her disposal, the effectiveness of a particular strategy of behaviour in the situation, as well as the possibility that new problems will be created as a result of one's own actions. With regard to transactions in which persons and environ­ment influence each other, we can see that primary and secondary appraisal also effect each other. A situation which was originally seen as threatening, can for example seen as less threaten­ing when a person realises that damage can probably be prevented by adopting a particular strategy of behaviour. Lazarus calls this reappraisal: a change in the original appraisal of a transaction, resulting from feedback on effectuated outcomes from this transaction, as a result of the person's actions, or by a (mere) re-thinking of the nature of this transaction. So appraisal is also a dynamic process in which changes take place constantly in the course of time and in which appraisal of the situation and one's own possibilities is constantly adjusted. Finally, we must observe that appraisal does not only mean rational assessment of the transaction, but also the quality and intensity of a person's emotional feedback on the transaction. For example, it is more likely that a positive assessment of a situation will cause a positive emotional reaction, such as joy or satisfaction. It is likely that a situation that is assessed as threatening will evoke negative emotions, such as fear or anger. In such cases a person feels that he/she is unable to react adequately to the demands that are made on him or her in a situation, in other words he or she feels that they are beyond his or her coping activities. In the next paragraph we will further discuss the concept of coping. "We regard coping as problem-solving efforts made by an individ­ual when the demands he faces are highly relevant to his welfare (that is, a situation of considerable jeopardy or promise), and when these demands tax his adaptive resourses." (in Coelho, 1974, p. 250-251). Coping activities can have two functions. First a person can try to improve the situation by changing his or her own behaviour or environment. Secondly, a person can try to control emotions evoked by stress, so that morale and social functioning will not be influenced. Lazarus calls this palliation, using a temporary measure to alleviate stress, such as denying, intellectualising or avoiding negative thoughts; in this way the situation itself does not change, but the individual makes sure that he or she feels better. Thus coping activities are not always rational or realistic, but can also be very irrational, primitive or rigid. Lazarus states that both kinds of coping are important; according to him realistic problem solving and primitive defensive mechanisms are two sides of the same coin. Lazarus distinguishes four types of coping activities: (a) Information seeking: investigating the characteristics of a stressful situation in order to gain the knowledge necessary to make a correct coping decision, or to be able to assess threat or damage differently. On the one hand, seeking information can form a firm basis for an individual's action, on the other hand it can make this person feel better, by rationalising or supporting a previous decision; this is called "palliation". (b) Direct action: action taken by an individual to handle a stressful situation, directed towards himself or herself or at the environ­ment, depending on environmental demands and personal goals. (c) Inhibition of action; suppression of action impulses that may otherwise cause damage, for example because they are morally or socially not acceptable, or because they can cause physical damage. (d) Intrapsychic modes: cognitive processes aimed at regulating emotions which arise as a result of stressful situations. As with other coping activities, they can be aimed at incidents from the past (for example the reinterpretation of a traumatic ex­peri­ence), or at future events (for example denying that a particular situation may become dangerous). Usually they are aimed at increasing the feeling of well-being of this individual; therefore, succesful intrapsychic coping activities may restrict the number of active attempts an individual makes to control his of her environment. Lazarus admits that his rather rough division of coping activities is a rudimentary classification system; and indeed, a number of significant aspects are lacking. For example, it does not include any details about possible coping feedback and any antecedent conditions or results of different types of coping behaviour. There is still too little known about which situations evoke which types of coping behaviour. Moreover, Lazarus states that motivational and emotional aspects of coping receive relatively very little attention in psychological studies. The developmental aspects of coping behaviour are also still unclear, and according to Lazarus studies of these aspects are essential in order to be able to understand the coping process clearly. Lazarus has developed a clear and understandable theory with regard to certain central concepts, such as the transaction between persons and their environment, the individual's appraisal of a transaction, emotional response on this appraisal and several types of coping activities. However, it is still not clear what exactly is the nature of the processes described. Some lack of clarity remains which Lazarus himself in fact also admits. Lazarus states, for example, that it is not clear which situations are experienced as threatening and not as a challenge, and by which persons (and vice versa). In the theory little is said about what kind of factors are important for acquiring coping behaviour and how the behavioural repe­toire a person has at his or her disposal to respond to environ­mental demands, may develop in the course of time. In the next chapter we will show how Apter's Reversal theory can provide an answer to a number of the queries mentioned above. One of the deficiencies observed in Lazarus' theory can be remedied by supplementing Apter's Reversal theory. The Reversal theory provides a (descriptive) answer to the question relating to the various ways in which people react to the same, or similar, situations. The Reversal theory states that as far as human motivation is concerned people are in one of two metamotivational states. The way in which a situation is experienced depends on the state a person is in at a particular moment. The two states can be distinguished by the level of arousal that is preferred. Arousal is defined in this theory as being mentally and physically prepared for action. The Reversal theory has been developed by Apter and Smith (1975; see also Apter, 1984). The theory deals with the way in which people experience motives for their actions and descibes the process of changes in motivation. In this theory an in­dividual is regarded as a complex "machine" that uses the environment for his or her own aims. This "machine" can behave according to different "programs" which determine the way in which the environ­ment is experienced. The idea that one action can be performed with different motives is central. For example, a person may ride a bicycle, because he or she has to attend a meeting. This is a determined action. Here, riding a bicycle represents the means by which an aim can be achieved. However a person can also ride a bicycle "just" for pleasure. In this case a person acts according to the program "wanting to be active", and cycling is an aim in itself. Thus, there are two possible states in which a person can be. These states are characteristic of the way in which an act, in this case "cycling", is experienced. In the case of the meeting this act is purposive. In this situation cycling is not an act undertaken to create stress or excitement; here the aim is to fulfill a particular task. In other words: to remove the tension that is caused by being obliged to fulfill this task. In the second case cycling is an action which in itself evokes particularly pleasant excitement. For this reason the Reversal theory rejects a simplistic-homeostatic interpretation of human motivation in which there is just one optimal state of balance at which individuals. This state of balance particularly refers to one optimal level of arousal. According to the homeostatic way of thinking, individuals will always try to achieve one optimal level of arousal and/or to remain at this level. However, the Reversal theory assumes that at times a low level of arousal is aimed and at other times, a high level of arousel. Therefore Apter introduces the concept of bi-stability. This means, for example, that people may or may not feel fine at a low or a high level of arousal. As the examples mentioned above show, at times one's aim may simply be the performance of a particular task and the act is not meant to raise the level of arousal. At other times a person may seek excite­ment, in which case the same or a similar act can suddenly become exciting (arousal increasing). To illustrate these ideas we can consider a number of situations in which different levels of arousal are experienced. Generally (but not necessarily), there is a high level of arousal when a person watches an exciting film. One can imagine that this excitement can be both pleasant and unpleasant. For example, when a person has been working all day and the work was very boring, a film can provide a welcome state of e­xcitement. On the other hand, when a person has just been threatened in the street, the tension caused by the film may be too much for him or her. In this situation a hot bath may be preferred as it is more likely to provide relaxation. Thus, there is a desired low level of arousal. The same hot bath may evoke boredom (in Apter's terms) in someone who has not done anything all day long. Therefore, it is important here that a particular level of arousal is not inadvertently connected with the person's well-being. These examples indicate that a person can feel good or not, depending on the level of arousal sought at that moment, in other words: depending on the metamotivational state a person is in at that moment. The level of arousal is always a subjective experience. In other words: an exciting experience for one person, may be boring to another. We have shown that there are two possible states of preference as far as the level of arousal is concerned. Firstly, there is the state in which a person aims at a low level of arousal and performs purposive action. This state is called arousal-avoidance or the telic state (telos is Greek for goal or purpose). In this state a low level of arousal is experienced as pleasant, Apter (1982) calls this "relaxation". A high level of arousal is experienced as unpleasant and is called "fear" by Apter. Secondly, there is the state in which a person aims at a high level of arousal and shows unpurposive action. This state is called the arousal-seeking or paratelic state (literally translated from Greek, paratelic means "without aim" or "goal-less"). In this state a high level of arousal will be experienced as pleasant "excitement", whereas a low level of arousal causes an unpleasant feeling: "boredom". These two states, telic and paratelic, differ as far as the experience of purpose, time and intensity is concerned (Apter, 1982; Mur­gatroyd, 1978, 1983). This is shown in table 2.1 (see the next page). The telic or paratelic state is as it were a frame round particular behaviour (Goffman, 1975). The states mentioned refer to the way in which the motivation of behaviour is experienced. For this reason they are called metamotivational states. These states determine how experiences are labelled (see table 2.2, following next page). At any moment in time a person is always in one of these two states. The period of time in which a person can be in a particular state varies from a few seconds to some days (Walters, Apter and Svebak, 1982). We will now describe how a reversal from one state to another can take place. Reversals take place involuntarily, although a person may be capable of getting into a situation in which a reversal into one or another direction becomes likely. The frequency with which reversals take place differs from person to person and is, moreover, dependent on the situation a person is in (Blackmore and Murgatroyd in Apter, 1980). The Reversal theory describes several conditions that can lead to a reversal. Most important are "contingencies"; aspects of a person or of the environment change in such a way that a reversal is triggered. For example, if a particular drug is used, if a visitor arrives unexpectedly or in an emergency situation. The second condition that can lead to a reversal is called "satiation". It is assumed that a reversal becomes more likely when the period of time in which a person is in a particular metamoti­vational state increases. A person then becomes more sensitive to signals from the environment or from himself or herself that can lead to contingencies. The different conditions influence each other, and can make reversals more or less likely. Table 2.2 and figure 2.1 show that a reversal from one state to another changes the meaning given to the level of arousal experienced. A reversal from the paratelic to the telic state, while a person experiences a high level of arousal, will result in a change from excitement to anxiety. A reversal from telic to paratelic, while a person experiences a low level of arousal, will result in a change from relaxation to boredom. 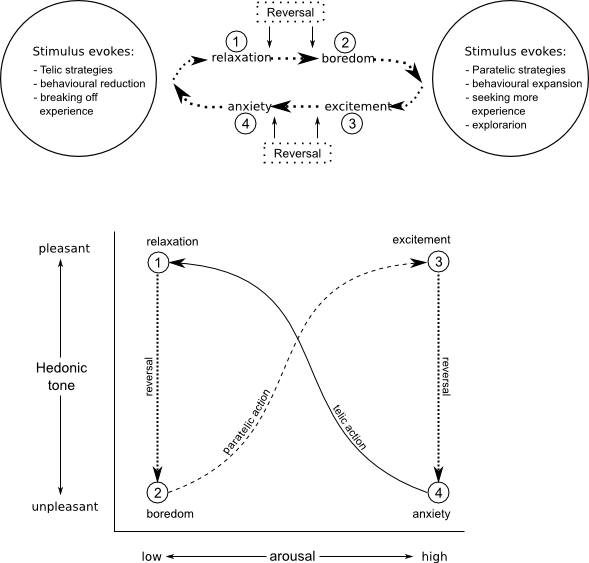 Figure 2.1 shows the way in which the process of interchanging emotions and motivation often takes place. However, another "direction" may be followed. For example, a person may remain in a state of anxiety for a long time, because he or she cannot relax suffi­ciently. This can happen to a person who is not completely in control of (a) particular situation(s). In this case it is unlikely that after some time a person will look for a state of excitement. It is also possible that the entire sequence of emotions (the butterfly figure) in figure 2.1 rises or falls along the vertical axis (Apter 1982). This indicates that a person feels mainly well or not well respectively. The first can take place when a person has many skills, and can handle all kinds of different situations well. This person will not experience boredom in the strict sense, because the unpleasant stage of the paratelic state will soon change into exploration or into other activities that cause excitement or/and which increase the hedonic tone. When, following a period of rest and/or relaxation a person reachies "satiation", he or she will not remain in a state of boredom (unpleasant), but will soon find opportunities to perform one or another paratelic action which will be experienced as pleasant. The butterfly in the figure may be at a lower level when a person is often anxious, or when he or she is chronically bored. Referring to Apter's model this situation can be explained by an inability to reach relaxtion. As this person is unable to relax sufficiently for example, owing to an absence of skills, he or she will soon become (once more) over-aroused and anxious when he or she is in an exciting situation. That is, such situations become more threatening when a person can experience fewer moments of relaxation (Apter 1982). Such a person will, therefore, sooner experience the reversal from the paratelic to the telic state. In other words: a person will relatively quickly get from the state in which the situation was exciting (paratelic) into the state in which the situation becomes frightening (telic). He or she will be relatively often in the stage of boredom or in the stage of anxious tension, while the periods of pleasant tension or pleasant excitement will be experienced less often. This person, there­fore, will explore for shorter periods and less often. As we shall explain further in chapter 5, such situations have serious consequences for the development of the process of learning. In our view, chronic boredom can be considered as a symptom of a situation in which mainly unpleasant moods alternate. As soon as there is satiation of the telic state, there will unconscious­ly be a reversal to the paratelic state. However, before arousal-searching, expansive behaviour gets going well, there will often be a reversal to the telic state. The (un­conscious) fear of risky exploration has become so strong that the paratelic meta­motivational condition itself has been affected and is experienced as threatening. As a result such a person changes constantly from anxiety (telic) to boredom (paratelic) and the other way round, while his or her mood does not improve in hedonic tone. The person finds it difficult to "really" relax, because he or she finds it difficult to make a "real" effort. For this reason, such a person will in general experience boredom, rather than relaxion. Although Apter's theory provides more insight into the different ways in which people can react to the same, or similar situations, some questions are still left unanswered. Firstly, the Reversal theory is only descriptive. It provides no insight into the underlying dynamics of the processes described. In other words: it is not clear how and why the reversals between the two states take place. Moreover, the theory does not provide a satisfactory causal explanation for the presence of the different states and reversals. Secondly, Apter describes his model as a symmetric model. This means that reversals from telic to paratelic, and reversals from paratelic to telic can be the result of contingencies, but also of satiation. A non-symmetric model is, however, more likely. We will show this in the next chapter. In chapter 1 we have pinpointed certain gaps in Lazarus' theory. One problem is that too little attention is paid to emotional and moti­vational aspects of human behaviour. As a result, there is still very little known about which kind of situations are experienced as threaten­ing and which are seen as a challenge (and vice versa), and by whom. In chapter 2 we have further discussed this in a descriptive way. We have stated that telic and paratelic states are metamotivational frames of behaviour that also explain the connection between threat and chal­lenge. In this chapter we shall discuss this further and highlight another gap in Lazarus' theory, namely the developmental aspects of coping behaviour. The metamotivational states (telic and paratelic) will be approached from an ethological perspec­tive; the importance of an optimal allocation of energy is emphasized. The concept of "energy" may be defined here from a psycholo­gical as well as from a physiological viewpoint. We shall discuss this further in 3.2. In chapter 2 we have also described two gaps in Apter's theory which will be filled in this chapter. Firstly, the mainly descriptive nature of Apter's theory will be given more explanatory power by focussing on the energy apects of metamoti­vational states. Secondly, the influence of contingencies and the influence of satiation on reversals in Van der Molen's model will be described as non-symmetric, whereas Apter describes his theory as a symmetric model. In his model Van der Molen (1983, 1984, 1985; Van der Molen, Van der Dennen, 1981) emphasizes that, basically, we have an "open-ended" learning system: "This is the ability to acquire a behavioural repertoire which is specifically tailored to the environmental situation an in­dividual happens to live in" (Van der Molen, 1984, p. 1). The learning abilities of an individual are optimally utilized, when his or her behaviour is organised in such a way that a surplus of energy is directly invested into extending and refining his or her be­havioural reper­toire. From a psychological perspective, when there is a surplus of energy, there is readiness and gumption to enter new situ­ations and to show explorative behaviour. Such behaviour may increase the survival value, particularly when certain experiences can subsequently be utilized in stressful situations and in emergencies. Therefore, skills have to be trained in situations with a high level of arousal. And situations which evoke a high level of arousal are particularly those in which risks will (have to) be taken. Thus, an open-ended learning system will provide a maximum survival value when the following conditions are fulfilled: firstly, there should be a tendency to look for situations that involve a high level of arousal when there is a surplus of energy, and, secondly, there should be a tendency to look for situations that reduce the level of arousal as soon as the suplus of energy is ex­hausted, or when there is an emergency. person to refill the energy supply. This is only possible when there is (relatively) little physical or mental exertion. These characteristics imply a bi-stable system in which the preferred level of arousal depends on the metamotiva­tional state (see chapter 2 and Apter 1982). In the paratelic state, i.e. when there is a surplus of energy, a person will prefer a high level of arousal. On the other hand, in the telic state, when the surplus of energy is exhausted, or when there is direct danger, the organism will seek relaxation. This will at first require energy output but the final and desired result is a lowered level of arousal. Figure 3.1 shows the reversals between the different states. By relating the learning system directly to the energy available, Van der Molen (1983, 1984, 1985) describes the way in which the paratelic and telic states alternate ideally. In the period of relaxation, energy is supplemented and acquired. When the energy supply has increased sufficiently (in other words: when there is satiation of the telic state) the individual will become bored and will, (once more) seek an exciting situation. In this state a high degree of arousal will be experienced as pleasant. However, when the surplus of energy is exhausted, there will be a reversal from the paratelic to the telic state. In this way, by looking for an easier or a comfort­ing situation or by controlling the fearful situation (i.e. after achieving relaxa­tion), the person can replenish the energy supply. Given the tendency to look for situations which are accompanied by a high level of arousal, there will be experimen­tation in the paratelic state with new or otherwise arousal-increas­ing skills and situations. In this way the behavioural repertoire will be tested, extended and refined. If the system functions well, the telic and the paratelic states will automatically and regularly alternate. Now the second gap in Apter's theory has been filled. The explanatory principle Van der Molen adds, is that a bi-stable system of motivation contributes directly to the chances of a learning organism to survive, by using its surplus of energy as efficiently as possible. Bowlby (1977) has shown empirically that regular periods of relaxation are of crucial importance for the ability and readiness to explore new situations. In his studies he describes that a child, exploring an unknown situation, regularly returns for a moment to a trusted person (in Bowly's case the child's mother). In this way the child can relax and acquire energy for the next bout of exploration. Many types of behavioural deficiencies, such as chronic fear, can develop, when the periodic need for relax­ation and reassurance cannot be met. On the basis of positive and negative learning spirals, Van der Molen (1984) explains how a behavioural repertoire develops. If the sequence relaxation - boredom - excitement - fear - relaxation and so on occurs often enough, this indicates that, generally speaking, there have been sufficient possibilities, whether or not self-crea­ted, to achieve relaxation in time and to replenish energy deficits. An individual will then develop an adequately functioning behavioural repertoire in which the various skills are integrated well. A person will then also be able to handel emergencies better and to relax easier and more quickly, so that after some time he or she will be able and ready again to explore, etc. This is called a positive learning spiral. Figure 3.2. The two types of learning spirals (Van der Molen, 1984) according to which acquiring and refining the behavioural repertoire will be the result of positive learning spirals, and a rigid stereotyped way of reacting a consequence of negative learning spirals. However, when there are not enough moments of relaxation, too little energy can be built up with the result that the in­dividual will explore less and will show telic behaviour more frequently. In this way the person will acquire fewer new skills and practise "old" skills less often. This is called a negative learning spiral (see figure 3.2). According to this model skills tend to grow in clusters. 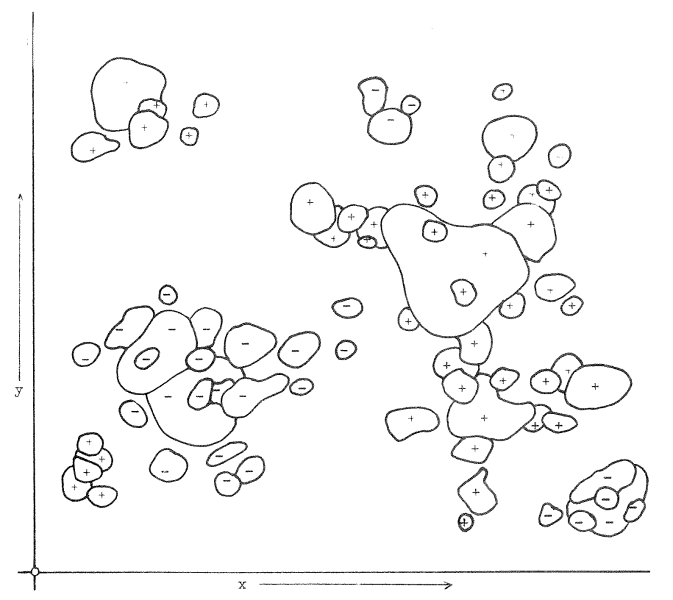 Following Grof (1972, 1973, 1976), Van der Molen calls such clusters "clusters of condensed experience" or "COEX-systems" (see figure 3.3). Grof gives the following definition of a COEX-system: "A COEX-system can be defined as a specific constella­tion of memories consisting of condensed experience (and related phantasies) from different life periods of the individual. The memories belonging to a particular system have a similar basic theme or contain similar elements and are associated with a strong emotional charge of the same quality. The nature of these systems varies considerably from one COEX-system to another". Grof distinguishes positive and negative COEX-systems, depending on the emotions related to the cluster. Van der Molen (1983, 1984, 1985) explains the reason for such a clustering of areas of experience. When particular situations have been explored many times and the experiences have been dealt with and digested adequately, there is a positive COEX-system in which various types of skills are included. Often these skills can be applied to other, but similar situations, so that those situations too can be more easily controlled and managed. In this way positive ex­periences tend to catalize the positive experiencing of similar areas and thus cause a positive COEX-system to grow. Experiences that have been dealt with badly tend to grow in clusters too. That is, when in a particular situation there is little exploration, and as a result little practise with particular relevant skills, it is difficult to get the situation under control, and thus to relax. The likelihood that new skills will be acquired is then also very low, so that the next time the individual is in the same, or in a similar situation, he or she will probably have another proble­matic experience. This increases the likelihood of telic behaviour (flight or avoidance behaviour) in similar situations, which causes even less experimenting. An example of a negative cluster is the behaviour of someone who does not dare to enter into contact with people anymore as a result of his or her shyness. This causes the fear for this kind of situation to grow, because the familiarity with these situations decreases continuously, and, moreover, the person is unable to adequately develop other skills for which he or she needs help from others (school assignments, for example). In this way it is likely that the individual will become caught up in a negative learning spiral in which new ex­periences are no longer used for learning but only intensify the existing, inade­quate, avoidance behaviour. It is difficult to escape from such a spiral. The most important (and necessary) condition for this is the ability to achieve relaxa­tion which is a prerequisite for dealing with experiences and for the replenishment of energy. Only then (careful) explorations of the frightening area can begin, with the possibility that this leads to fewer negative or even to positive experiences. If a number of areas which have been dealt with succesfully, for which skills have been developed, are closely related to an area of experience that has been dealt with badly, they may sometimes serve as a "refuge" when situations threaten to become frightening. Through retiring into such a refuge the necessary relaxation can then be acquired. It is important to keep in mind that a positive COEX-system does not necessarily consist of pleasant experiences. Positive COEX-systems, and in particular important COEX-systems, develop through a proper reprocessing and digestion of formerly negative experiences. A negative COEX-system consists of negative experiences that have been dealt with badly and have been (re-)processed and digested insufficiently. The develop­mental aspects which play a role in acquiring and extending coping skills and which have not further been developed by Lazarus, are thus discussed explicitly by Van der Molen. Figure 3.3. Hypothetical example of the growth of positive (+) and negative (-) systems of COndensed EXperience in the field of experiences (from: Van der Molen, 1984). At the beginning of this chapter we have mentioned that Apter presents his theory as a symmetric model. Van der Molen (1984) indicates that contingencies in particular cause a reversal from paratelic to telic, and that satiation is one of the primary causes of a reversal from telic to paratelic. Van der Molen places emphasis on one particular sequence, that from relaxation to boredom, from boredom to excitement, from excite­ment to fear, and from fear back to relaxation. The reversal from telic to paratelic behaviour is here a reversal from relax­ation to boredom. According to Van der Molen, this reversal will usually the result of satiation. The reason for this concerns energy; we have discussed at the beginning of this chapter, the capacities of an open-ended learning system are optimally utilized if any surplus of energy is invested in gathering more experience. A reversal from the paratelic to the telic state, on the other hand, is caused in particular by contingencies. With reversals from paratelic to telic, Van der Molen places emphasis on the sudden transition from excitement to fear. By looking for arousal-increasing situations in the paratelic state, risks are taken and a greater likelihood exists that a particular situation will suddenly get out of hand owing to contingencies which cause a reversal from paratelic to telic behaviour. In this chapter we have described Van der Molen's learning model which provides us an insight into the way in which the learning system is unconscious­ly kept going as long as there is a regular surplus of energy. We have observed that energy levels form the basis for the telic and the paratelic states and considered the emotional and motivational aspects of coping behaviour. Moreover, the developmental aspect of coping behaviour is explicitly discussed in Van der Molen's model, in the form of descriptions of positive and negative learning spirals and the clustering of related areas of experience. The concept of positive and negative COEX-systems can also be regarded as a first initiative to roughly categorize cognitive contents. Finally, we have discussed why Van der Molen regards satiation as a prime reason for the reversals from telic to paratelic and contingen­cies as the main cause of reversals from paratelic to telic. What is still lacking in this model, is a more detailed description of the way in which emotional and motivational states are related to cognitive contents. This aspect will be addressed in the next chapter as we discuss Lewicka's antagonist model of cognitive styles. In chapter 3 we have described Van der Molen's discussion of the emotional and motivational aspects of the learning process. Lewicka's model (1987, for example) in which there are two antagonistic modes of cognitive information processing, provides a description of the cognitive aspects. We will show how this model supplements Van der Molen's model. Lewicka distinguishes two types of behavioural regulation, the mechanism of action-control and the mechanism of action-involvement respectively. Like Apter's theory, Lewicka's theory too states that an individual is always in one of the two regulationary modes; there are two antagonistic mechanisms of cognitive functioning which alternate in time. The mechanism of action-control instigates actions, aiming at the achievement of a particular objective (com­parable to the telic state). Lewicka states that there are particular "activity-external comparison standards" which means that the achievement of an external objective is central and that the activity itself is not the objective of the individual. The mechanism of action-control is controlled by a principle of negative feedback; thinking of a particular standard (the objective), the individual assesses his or her situation. A discrepancy between the actual and desired states is experienced as unpleasant and causes instrumental behaviour (correct­ing mistakes, if any, and minimalising the discrepancy), until the objective in view has been achieved. Lewicka calls this "con­trolling": the objective regulates the be­haviour of the in­dividual. The most important function of the mechanism of action-control is to maintain the level of organisation the individual has achieved. However, if an organism is to be able to grow, he or she must be capable of creating entirely new objectives (by him or herself), for example in order to be able to adapt to changing or still unknown environmental demands. The mechanism of action control itself is not suffi­cient. For this, the mechanism of action-involvement is essen­tial. The mechanism of action-involvement encourages the in­dividual to take actions which are not instrumental or purposive: in fact the individual's activity is an aim in itself (comparable to the paratelic state). Although sometimes there seems to be a particular external objective, this is often random and more like an "excuse" for the activity, than that the person really tries to achieve that objective. The motivation for the activity is the activity itself. The mechanism of action-involvement is controlled by a principle of positive feedback. The factors that cause the behaviour and maintain it lie in the behaviour itself; this is a process of self-amplification: the behaviour intensifies itself. The function of the mechanism of action-involvement is the production of new, so far unknown, results of behaviour, or the further exploration of activities that have been tried out before. In this way the individual will not only be able to obtain more information, but also indications about promising directions of future activities. Lewicka calls this "directing" which means that the behavioural results themselves are guidelines for future behaviour. Since the behaviour is not directed at established goals, the activities of the individual in the action-involve­ment mode are often very unpredictable. Table 4.1 provides a summary in catchwords of the main differences between the two mechanisms of regulation described by Lewicka. Purposive action Activity "for the activity"
Table 4.1 shows once more that there is much similarity between the mode of action-control and the telic state and between the mode of action-involvement and the paratelic state. According to both Lewicka and Apter, the motivation for activity is central: they distinguish between activity aimed at a particular external objective and activity as an "objective" in itself. The difference between Apter's and Lewicka's approaches lies in how they further work out this distinction into two modes of behaviour. Apter discusses in particular the motivational and emotional aspects concerned. Lewicka, on the other hand, discusses in particular the cognitive aspects. In our view both theories can be combined to form a more complete picture of the alternation of behavioural modes. This will be explained in the remainder of this chapter. First we will discuss what Lewicka calls evaluative standards which, according to her, are operative in the action-control mode. In the mechanism of action-control there are two forms of evaluative standards of comparison: on the one hand positive standards which indicate what a person ought to do (for example particular assessment criteria an achievement has to meet), on the other hand negative standards which indicate which limits cannot be passed (for example particular social standards which indicate what types of behaviour cannot be regarded "decent"). Lewicka calls them "standards of goodness" and "stan­dards of badness" respectively. The two types of standards are not entirely symmetric which means that a categorisation of a result as "not good" does not imply that this result is regarded as "bad" (and vice versa). There is a third category possible which is "non-sub­stantial" which means: neither good, nor bad (see fig. 4.1). Lewicka (1985) states that if certain standards of goodness are difficult to attain (for example rigid social rules of behaviour or idealised criteria for achievements), it is hard for a person to reach that standard. An example of this is a person who is in a very rigid environment, such that he or she must con­tinuously take part in particular activities in order to be appreciated. In such situations there is hardly any opportunity for non-purposive behaviour and a reversal to the mode of action-involvement is not very likely. When there are rigid, strictly defined and narrowly limited standards of badness which means that there is a small number of categories appraised as "bad" and thus a large number of "non-substantial", a person can very easily avoid "bad" behaviour. At first this may bring about a feeling of relief, as it is very clear what is not "al­lowed", but this situation may eventually also lead to boredom which, according to Van der Molen's learning model, makes a reversal to the mode of action involvement more likely. An example is the story of Adam and Eve in Paradise; everything was allowed, except eating apples from the Tree of the knowledge of Good and Evil. The rest of the story we know. Within the mode of action-control the activities an individual is engaged in are either instrumental actions of approach aimed at producing results categorised as "good" by positive standards of comparison, or instrumental actions of avoidance aimed at avoiding results categorised as "bad" by negative standards of comparison. The functional conditions are efficiency and minimization of mistakes; the least effort and the least costs for achieving a positive, or for avoiding a negative result, the better. According to Lewicka the criteria of evaluation in the action-involvement mode are quite different. Lewicka uses the informative contents of activities as criteria. The search for a maximum of information is then the guideline for the choice of behavio­ur. "A catagorisation as "good" applies to all those alternatives of behaviour which provide individual with new infor­mation and reduce uncertainty", Lewicka states. Apparently Lewicka contradicts herself here, because in the definition of the mechanism of action-involvement she states that actions are brought about which do not aim at a par­ticular objective. However, later on, she states, as we have described above, that the individual in the action-involvement mode aims at obtaining new information and reducing uncertainty. So apparently there is an aim for a particular objective. In our view this problem can be solved when the parallel between the action-control mode and the telic state on the one hand and between the action-involvement mode and the paratelic state on the other hand is regarded more closely. As we have previously mentioned, behaviour in the action-involve­ment mode is maintained by factors stemming from the activity itself. It remains unclear, however, what kind of factors are involved here. Apter explains this by his assumption of striving for pleasant tension as a general motive for behaviour in the paratelic state. If this idea is accepted as a supplement to Lewicka's theory, we can say more about whether purposive behaviour does or does not exist in the mode of action-involve­ment. In our view, it is important to make a clear distinction between the proximal and the ultimal purposes of behaviour in the action-involvement mode. The term "proximal purpose" refers to the objective at which the person aims at the moment of the activity. Contrary to the mechanism of action-control, there is no external objective in the mechanism of action-involvement, but there is activity because of the activity itself; the (proximal) "objec­tive" of the person is the behaviour that provides pleasant tension. The ultimal objective of similar activities corresponds with the function of Lewicka's mechanism of action-involvement: it enables the person to acquire new experiences, to learn from them and thus enhances growth which in turn means the achievement of a higher level of cognitive organisation. A person is not aware of this ultimal objective at the moment the very activities take place. When Lewicka mentions be­havioural alternatives with a high informative value which are categorized as "good", this must be interpreted as "good" with regard to the ultimal objective of the mechanism of action-involve­ment. The criteria the person applies at the moment of the activity itself, will not have any bearing on the informative value of the activity, but on the importance of the activity for the person, that is on the possibily that it may provide pleasant tension. The ultimal advantages of action-involvement behaviour make it evolutionarily advantageous that this behavioural mode exists in which arousal-rising and pleasure in the action itself are the proximal "goals" (see Van der Molen, 1983). We can perhaps go further than Lewicka in answering about the question: which kind of activities have the greatest informa­tive value? On the one hand, these are of course activities in areas of experience that are new and unknown to a person. Exploration of such areas is less likely in the action-control mode because a person cannot rely on familiar objectives. This involves the risk of unexpected, unpleasant things happening. This leads to tension which is experienced as unpleasant in the mode of action-control. According to Van der Molen's learning model however, it is exactly unfamiliarity that produces tension which makes exploration inviting in the action-involvement mode. Activities that are closely related to areas categorized as "bad" may in the action-involvement mode also be experienced as interesting. In the action-control mode the person tries to avoid such areas as much as possible and aims at achieving results categorized as "good". In our view "good" areas are not interesting in the action-involvement mode: they are familiar and do not create any tension. Approach­ing the "bad", risky areas, on the other hand, is exciting and, what is more, it has the (ultimal) advantage that the limits of these risky areas are explored and thus become more distinctly defined for the person. This will ultimately be of advantage to his or her freedom of movement: if the borders between what "is possible" and what "is not possible" are clear, this will be of advantage to the person whenever the mechanism of action-control is activated again and he or she tries to prevent "bad" results. As we have stated above, Lewicka's ideas concerning the informa­tive content of activities can be extended and explained by adding the concepts "proximal" and "ultimal" goals. Following the informative content of activities, we shall discuss in the next paragraph in more detail how such information is processed cognitively. How can you make Q happen? What will happen if P? According to Lewicka the first two questions are "closed-ended", because the result Q has already been specified. This specifica­tion can be based on a criterion of "goodness" or on a criterion of "badness". The appraisal of the expected result determines to a great extent which particular question the individual will ask in partic­ular. The fact is that when the results have been appraised as positive­, people are particularly interested in the question "how" these results may be achieved. If the results, on the other hand, have been appraised as negative, the "why"-question is especially interesting (Wong & Weiner, 1981; Weiner, 1984). Lewicka relates these questions to the concept of "sufficient" and "necessary" conditions. We will first explain what is meant by these "sufficient" and "necessary" condi­tions. Put the pan onto the cooker and turn on the gas. When the water boils, wait another four minutes. Turn off the gas and pour off the water. When these conditions have been met, the person will indeed get his egg boiled. However, this is not the only way to boil an egg. It could be boiled in an old can on a campfire, for example. A series of sufficient conditions, therefore, indicates how a particular result can be achieved, but this does not imply that when these conditions are not met, the result cannot possibly be achieved in another way. A necessary condition is a condition that has to be met, because there is no other way in which a particular result can be achieved. The necessary condition in the example of boiling an egg could be: "Heat the egg to a tempera­ture that is above the coagulation tempera­ture of the egg white, until the heat has spread throughout the egg". The way in which the egg is heated is not specified, as in fact this is unimportant. Only the fact that the egg is heated for some time is important; otherwise it will never be boiled. Departing from the necessary conditions for a particular result, it is often possible to generate various series of sufficient conditions. As mentioned above, when the results have been appraised as positive, people particularly aim at finding sufficient condi­tions to achieve this result which means that they are par­ticularly interested in the question: "How can I make sure the result will be achieved?". So there is a strategy of "approach", aiming to achieve desirable results. When the results have been appraised as negative, on the other hand, people particularly aim at finding the necessary conditions for these results. Only if someone knows why an unpleasant result comes about, will he or she be best able to effectively avoid the necessary condition(s) for this result and thus to avoid the unpleasant result itself. This is in fact a strategy of avoidance, aimed at preventing undesirable results. There is a great difference between these two types of information processing. To find sufficient conditions for a result, a "sufficiency-oriented method", it is in principle sufficient to know that a particu­lar result will come about after meeting one particular condition or combination of conditions. Then the person will be able to remember this simplistic connection and knows that meeting those conditions again will be sufficient to get the same result again. Seeking necessary conditions, a "necessity-oriented method" implies a greater investment of time and energy. To distil the necessary conditions from the various sufficient conditions for a particular result, more experience and skill is needed, as well as a certain degree of experimenting and the cognitive processing of acquired ex­periences. Only by examining several conditions separately, will it be possible to find out whether they are essential for a particular result and, if so, why. This investment of time and energy (proximal costs) has, however, some (ultimal) advantage which is the possibility to make the cognitive structure concerned more economical, sparse and logically coherent. As it becomes clear "why" a particular result occurs, it can be obtained or avoided more effectively. The large quantity of suffici­ent conditions is then, in fact, reduced to a smaller number of necessary conditions. From these necessary conditions, relatively strong and efficient rules can be distilled, so that an individual does not need a separate list of sufficient conditions for each result. 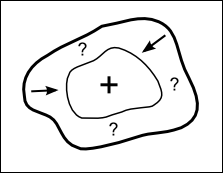 In this way a large number of answers to the "how"-question can be replaced by a single answer to the "why"-question. As we have stated, a certain amount of experimenting is needed to develop a necessity-oriented method. New, additional knowledge about the results of behaviour must be acquired. At this stage the "what"-question will be important. 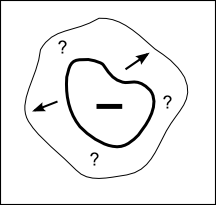 According to Lewicka the "what"-question is "open-ended", because there is no previously specified result. This question will in particular emerge during the exploration of novel areas; there will be experiment­ing with behavioural alternatives, without aiming at previously determined results. In other words: activities will be engaged in, just to investigate their effects. Referring to our learning model, it will be clear that the "what"-question will emerge in particular during the state of action-involvement (comparable to the paratelic state); experimenting is attractive in this state, because the unfamiliarity of the result will be seen as exciting and pleasant. We have to observe that the appraisal of the expected results has a significant influence on whether the person does or does not put much effort into developing a necessity-oriented method. That is to say, the interests of the person on a proximal level play an important part here which means the interests the person is aware of at the moment of the activity itself. In the action-involvement mode those interests are the achie­vement of pleasant tension. Exploring of and experiment­ing with the limits of areas categorized as "bad" or problematic­, causes considerable tension: after all there is a chance that there will be a less pleasant result. Exploring areas categori­zed as "good" (or well processed and digested) provides hardly any tension: the only thing that may happen is that an expected pleasant result will not take place. However as the person will generally have one or more sufficien­cy-oriented methods for achieving desirable results, he or she can always make sure those results will be achieved, should it be necessary. When a person wants to explore things, seeking tension, these areas are rather unattractive and his or her attention will almost automatically be attracted to the more interesting, unfamiliar areas that are either related to an area that has been dealt with well, and even more directly related to the more risky areas, categorized as "bad". 4.8. Pleasant and unpleasant results, necessary and sufficient conditions, acceptance of chances of mistakes and cognitive "bias"
In the action-involvement (paratelic) mode, attention is automa­tic­ally drawn to a further exploration of the conditions of results. When the results are pleasant, the consequences for the cognitive processing system are entirely different from those when the results are unpleasant. As we have stated in paragraph 4.6, working with necessary conditions is the most efficient. Acquiring "sufficient" behavioural strategies is less compl­icated and quicker to realise, however. To that end the "why"-question does not have to be examined intensively. Any answer to the "how"-question will do. Therefore, if an additional investment in time and energy is made, needed to come from sufficient behavioural strategies to knowledge of necessary conditions, it will in general be invested in the first place in unpleasant results, in order to determine their conditions more accurately. When examining pleasant results it is of course more efficient to know the necessary conditions, but in those cases it is less crucial, because there are fewer risks. Indeed, any sufficient conditions will meet the purpose, that is, to achieve pleasant results. There is another problem, however. In practise it is in general impossible to make accurate predictions about be­havioural results. The cognitive models of reality we create are just approaches. The higher the required degree of accuracy, the more experience and information has to be invested. All cognitive models have a particular degree of uncertainty. Which uncertain­ties will be minimized in the first place, depends to a great extent on the nature of the expected results. Table 4.2 gives a summary of the possible antecedents and results in the case of pleasant and in the case of unpleasant results. This table is a free modification of Lewicka's (1985). To be perfectly clear, we have made a separate table for pleasant and unpleasant results respective­ly. However, as far as terminology is concerned, these tables differ a little from Lewicka's. The fact is that it is not always clear what Lewicka means with the terms "positive" and "negative", because she uses them in two different ways. Lewicka uses, for instance, the terms "positive outcome" and "positive hit". In the first term "positive" means: positively appraised or appreciated. For clarity's sake we have chosen the term pleasant for positively appraised results and unpleasant for negatively appraised results. Of course we have not changed terms like "positive hit" and "negative hit", because these are terms from logic and mathematics. When departing from the idea that people generally try as hard as possible to avoid disappointments, the table makes clear why some specific cognitive strategies are more likely to occur in connection with some specific results than others. Each cognitive strategy of course also harbours its own chances of mistakes and "bias". If any unpleasant results can occur, a person will generally try to avoid them. Disappointments arise when there are unpredicted unpleasant results (false negative, "type II" mistake). We know that when the probability of a Type II mistake is made as small as possible, the probability of a "Type I" mistake will, as a consequence, increase (see for example Nijdam & Van Buuren, 1983). In this case a "Type I" mistake is a pleasant surprise for the individual: an unpleasant result was predicted, but it did not take place. At the level of the behaviour of the individual this means, that during the action-control mode (in which unpleasant results are actively avoided), the individual will take a large "safety margin"; not only will the area be avoided for which there are clear negative standards of appraisal, but also the areas that are closely related. The chance of a Type II-mistake reduces this, but the area that has been avoided will usually be larger than is really necessary. This is shown in figure 4.2. One result of this safe strategy is, that during the action-control mode particular areas will remain unexp­lored and thus unfamiliar to the individual. Such large safety margins can only be rendered superfluous by a further elucidation of the necessary conditions for the unpleasant result. Its borders then become narrower, sharper and more accurately defined (see figure 4.2). In terms of figure 4.1: the acquisition of more necessity-oriented information reduces the size of the "no good" areas and increases the available be­havioural manoeuvering space. On the other hand, as we have said before, vaguely defined borders provide pleasant tension in the action-involvement mode and such areas which were rather avoided in previous, action-control modes, will become more attract­ive and may be explored more closely. When an individual may expect positive results he or she will follow quite a different strategy. A disappointment would mean here that a pleasant result is predicted, but does not take place (false positive, "Type I" mistake). The individual will try to avoid this as much as possible. Minimizing the probability of a Type I mistake implies that the probability of a Type II mistake will increase which is the chance that there will be a pleasant result, although it was not predicted; an unexpected surprise. In the action-control (telic) mode the individual will probably choose for a safe strategy : starting from one or another familiar sufficient method the individual will aim at achieving the pleasant result, without taking risks. The area of behavioural options the individual then aims at is most likely be smaller than is really necessary. This is shown in figure 4.3. It is clear now that adhering to a single existing sufficient method in the action-control mode limits the be­havioural repetoire of the individual; he or she will rarely experiment with other strategies of behaviour than the one that is familiar and tested, for fear of not achieving the that the expected, pleasant result. However, in the state of action-involvement experimenting with alternative strategies is attractive. Especially close to the areas cate­gorized as "good", the individual can always benefit from the familiar sufficient method in case of an emergenc­y. This means that there will probably be less tension than might arise close to an area categorized as "bad". After further exploration, the "safe" area can thus be extended by supple­menting more sufficient methods. Should the individual eventually succeed in generating a necessity-oriented cognitive representation of this pleasant result, even more degrees of safety, as all sufficient conditions would also be defined by implica­tion. Both with pleasant and unpleasant results, necessity-oriented cognitive models will allow the greatest freedom of movement and beha­vioural efficiency. The area of unpleasant results (see figure 4.2) will be smaller and the area of pleasant results (see figure 4.3) will be larger. It is clear, however, that the need to invest more energy in obtaining "necessary" cognitive connections will be strongest in the case of unpleasant results. In chapter 3 we have shown that in fact this is what really takes place. The problematical areas of experience produce the most arousal (because of the possible unpleasant results) which makes these areas more attractive in the action-involvement (paratelic) mode when there is enough energy to invest in exploration. As a consequence, in such problematical areas there will relatively quickly be enough experience and information available to achieve cognitive structures of "necessity" at a higher level of abstraction and integration. In this chapter we have discussed how Lewicka's theory can supplement Van der Molen's learning model. The cognitive aspects of the learning process have been discussed and integrated, in order to create a more comprehensive model. We have discussed the difference between action-control and action-involvement and the parallels with the telic and paratelic states. Subsequently the evalua­tive criteria that are active in the action-control mode have been discussed. With regard to the evaluative criteria in the action-involvement mode it appeared that a relatively easy supplement (similar­ity with the paratelic state and the differ­ence between proximal and ultimal objectives) sufficed to remove an apparent contra­diction in Lewicka's theory. Finally we have discussed the way in which the evaluative appraisal of possible results determines the kind of information an individual seeks, the strategy of behaviour that will probably be chosen and the kind of cognitive mistakes that can be made in processing information. In the next chapter we will show how these theories complement each other in such a way that a dynamic model emerges that includes the most important aspects of the learning process, that describes cognitive growth and which can be utilized in many areas of research and practical application. By way of summary, table 4.3 shows the most important character­istics of the action-control and the action-involvement modes. In this chapter we will describe how one coherent model can be constructed from the theories discussed. This model describes and explains more than each theory separately. We have called this model the Cognition-Energy-Learning model (C.E.L). The model shows how development and learning can be examined from a perspective of energy potential. The cognitive and emotional aspects that play a part in the learning processes, are also accounted for in this model. In the previous chapters we have shown that there is a distinction between a telic and a paratelic phase. In the telic phase, the behaviour is directed by a particular goal, avoiding fear and seeking safety, for example. In the paratelic phase, on the other hand, the behaviour is a goal in itself; behaviour takes place "just for fun". Thus, in this phase tension is experienced as pleasant and exciting, while in the telic phase it is experienced as frightening and unpleasant. A condition for paratelic behaviour is a surplus of energy which can be spent on exploring and trying out new things. Telic behaviour takes place at the moment the surplus of energy becomes exhausted or when an emergency arises. What has been stated above, makes clear that the energy dependent basis of motivation and emotion is extremely important; the motivational state of an individual depends strongly on the quantity of energy at the person's disposal. An important consequence is a strongly dynamic character of the organization of motivation; motivation and emotion change constantly in the course of time. In the telic phase a person will try to get his or her situation under control. Bringing a situation under control will at first take energy, but once the situation is under control the individual can benefit from familiar skills which cost (rela­tively) little energy (see chapter 3). In this way the individual can relax and gain new energy which can be spent again in the paratelic phase. There is no optimal level of energy an in­dividual aims at as for there are continuously reversals. In the telic phase rest and relaxation are aimed at. However, once relaxation has been achieved and the individual has recuperated enough energy, there will be a reversal; rest is no longer regarded as pleasant, but even as dull and boring. The reverse happens in the paratelic phase. In this phase a high level of tension is aimed at, until a reversal to the telic state (owing to fatigue or an emergency) occurs and the person tries to relax again or to get the situation under control. Reversals can be explained if the use of energy which is the basis of the behaviour of the individual, is taken into account. There have to be reversals to the telic state; a person cannot constantly show paratelic behaviour, as the energy required will be exhausted at a certain moment. Moreover, endless explorative and arousal-seeking behaviour will cause difficulties sooner or later which in turn may cause an emergency situation which in turn will force a reversal. For this reason, the cause of these types of reversal have to be sought on a very proximal level. On the other hand, the reversals to the telic state have important con­sequences on an ultimal level; that is, an organism will have the best yield in terms of survival value when the energy, gained during the phases of relaxation in the telic mode, will subsequently be spent on the extension of one's own be­havioural repertoire (Van der Molen, 1984). In chapter 3 we have described Van der Molen's model and a sequence in which the telic and paratelic modes should alternate ideally. This sequence is: boredom - (explorative behaviour) - excitement - (reversal to the telic state) - fear - (seeking rest) - relaxation - (reversal to the paratelic state) -boredom - etc. Should this sequence actually take place, the result would generally be optimal; in the paratelic phase the individual explores the environment and in this way he or she gains new experiences, using skills he or she has acquired previously. When these skills prove insufficient for the and the situation threatens to get out of hand, there will be a reversal to the telic phase and the individual will seek control of the situation and rest. On the one hand these periods of rest are necessary for recovery of the balance of energy and on the other, newly acquired skills and experiences can be integrated with earlier experiences. This implies that after a series of reversals the individual may be at a higher level of cognitive organisation than before. In this way the individual may grow and learn from his or her experiences in the course of time. There will not always be such ideal sequences of telic and paratelic phases. A person may not be able to relax optimally in the telic phase. This is often the case if he or she does not have the adequate skills or coping strategies to get the situation under control. In this way the situation remains frightening, the person does not relax sufficiently and thus does not get the opportunity to gain new energy which is a condition for another paratelic phase. The situation will probably be explored less quickly (paratelic) and there will be no experimenting with skills which would enable the individual to behave adequately in this situation. And since no new experiences are acquired in that area of experience from which the person could learn, he or she will remain at a lower level of functioning and there is a high probability of accumulations and fixations of simplistic avoidance behaviour. What has been stated above makes clear that for the individual some specific areas of experience can be problematic­al, while at the same time other areas are non-problematical. Problematical areas of experience are those areas for which no, or only a few, adequate coping strategies have been developed; the area has not been dealt with well. For the non-problematical areas of experience, adequate coping strategies have indeed been created; these areas have been dealt with well. In chapter 3 (following Grof 1972, 1973), areas of experience that have been dealt with badly were called "negative COEX-systems", and areas that have been dealt with well were called "positive COEX-systems". Table 5.1 shows what these positive or negative COEX-systems imply. At the beginning of this chapter we stated that it depends to a great extent on the metamotivational state of a person whether he or she experiences a situation as pleasant or un­pleasant. Problematical areas of experience that have not been dealt with well will cause tension. In the telic state this will be experienced as un­pleasant and frightening and there is much chance of avoidance behaviour. The person will seek areas of experience that have been dealt with well; in those areas the person is able to control the situation and thus to relax. In the telic state, areas that have been dealt with well can be a "refuge" which is helpful when the person gets into a frighten­ing situation. In the paratelic phase this is of course not the case. In this phase the areas that have been dealt with well are experienced as boring and thus as less pleasant because they do not longer provide arousal. It is the problematical areas that are attrac­tive in this phase because there can still be some experimenting and an element of risk is involved; this provides pleasant arousal (compare chapter 4). At the beginning of chapter 3 we have discussed the biological relevance of the telic and the paratelic states. From what has been stated above it becomes again clear that both phases are necessary in order to function well. In the telic state the individual is able to relax, once he or she has succeeded in getting the situation under control, and will thus be able to gain new energy and to integrate the newly gained experiences into his or her existing cognitive system. This system enables the individual to remain at a particular level of functioning. In the paratelic phase new or problematical situations (and in the telic phase situations that are ex­perienced as fearful) will be explored and new situations can be investigated. By continuously exploring a situation that has not yet completely been digested and controlled, and by dealing with those experiences and digesting them, this situation will lose its connotation as frightening and the individual will learn which strategies are adeqate in that situation and which are not. Thus the paratelic phase is also a necessary condition for the growth of the individual. Thus, we can state that the proximal goal of the telic phase is: seeking rest and relaxation. The ultimal goal is: maintaining a certain level of functioning. The proximal "goal" of the paratelic phase is experiencing pleasant arousal (by way of non-direct purposive behaviour). However, the ultimal goal is creating the conditions for achieving a higher level of function­ing. At this point we can once more emphasize an important characteristic of the way in which the reversals from one phase to another come about. In chapter 2 we have stated that we must not hold fast to the idea of a symmetrical model. The reversals from paratelic to telic will mainly be the result of an emergency or of fatigue, while the reversals from telic to paratelic will particularly take place as a result of "satia­tion". In this respect Apter's theory has therefore also been supplemented. In chapter 4 we have stated that there is much similarity between Lewicka's mode of action-control and Apter's telic state, and between the mode of action-involvement and the paratelic state. Apter emphasizes the motivational and emotional aspects of reversals in particular, while Lewicka places emphasis on the cognitive aspects. We shall now describe how the two theories can supplement each other and thus provide a more complete description of the processes involved. Lewicka mentions "standards of goodness" and "standards of badness"; particular standards that indicate what kind of behaviour has to be aimed at and what kind of behaviour can better be avoided (see chapter 4). Czapinski (1986, 1987) completes this with his study of the appraisal of experiences which indicates that people generally show a mild "positivity bias". This means that generally experiences have a mildly positive connotation (except when they have a specific and very strong connotation). Therefore, according to Czapinski, there is a lightly positive background in the cognitive representation of ex­periences in which the negative areas of experience are particularly important. Departing from these ideas, we are now able to say more about cognitive development. Figure 5.1 shows the combination of these ideas. This figure strongly resembles the figure in which Van der Molen showed Grof's theory of COEX-systems (see chapter 3), but is more detailed. The development of the cognitive system can now be described as follows. The areas of experience with the unpleasant connotations, that is the areas that have not yet been properly dealt with well yet and digested (- -), will be arousal-increasing and cause tension. In the telic state the areas that have been digested well (+ +) are attractive because they are controlled in such a way that in an emergency, a state of relaxation can easily be achieved. We will refer to these areas with the term "refuges". In the paratelic state, it is par­ticularly the areas that have not been digested properly yet which will be attractive because in that state tension is experienced as pleasant. We now make the assumption that in the paratelic state the borders of the exciting areas are explored, which means that those areas will be explored first, that are closer to the area for which there is a "standard of badness" and for which there is a relatively high probability of an unpleasant surprise. On a proximal level only (pleasant) tension and excitement are sought. However, as a result of such explora­tions, the limits of the areas that have been digested badly will gradually move; as a result of positive experiences parts of the area are "cut" and are bit by bit turned into areas that have been dealt with and digested well. In this way the individual learns and is able to develop further. On an ultimal level the paratelic state certainly has a goal, namely the acquisition of the new experiences necessary for further development. What finally happens in the optimal case on a logical-cognitive level, is that, based on the experiences gained from exploration, a comprehensive neces­sity-oriented method of a higher level of abstraction will be constructed out of and in place of the existing sufficiency methods (see chapter 4). One prerequisite is, however, that between the actions sufficient time and rest can be gained to digest new experiences and to integrate them. A simple example may clarify this. Imagine: John is walking in the woods. He enjoys the scenery and relaxes completely. Occasionally he climbs a fence to walk a little in the pastures or in a part of fenced woodland. Suddenly, from behind the trees a horse gallops towards him and John does not even think, but runs as fast as he can. Somehow he manages to get away and not until later does he wonder what exactly has happened. First he does not dare to go into the woods again, but after some time, when he has calmed down, it does seem exciting to him (paratelic) and he decides to stay near the fences so that he will be able to escape by climbing a fence, should this be necessary (refuges in frightening situations). In this way John explores the situation and finds out in which area of the woods the horse is and which part of the woods and which pastures he must try to avoid. The tension of walking decreases more and more because he now knows exactly where to be on his guard. So, finally, the motivation to explore the woods in the paratelic state is lost. In this example John is unpleasantly surprised and is at first frightened in the woods. However, once he has explored the situation, a sufficiency-oriented method ("If I walk in the same area as I did before, a horse may gallop towards me at a given moment") will be changed into a necessary-oriented method ("Only if I climb that particular fence, will the horse gallop towards me"). As a result, John's freedom of movement has increased because it is obvious that the area to be avoided has been restricted. This is shown in figure 5.2. What happens is that an area of experience which is first experienced as problematical (unpleasant in the telic phase) is gradually reduced because its limits are explored (in the paratelic phase) and there may be positive experiences on that fringe. To speak in Grof's terms, the purpose of paratelic behaviour on an ultimate level is to change as many negative COEX-systems into positive COEX-sytems as possible. In other words, the target is to exchange less efficient sufficiency-oriented methods, related to experiences that have been dealt with and processed badly, for highly efficient necessity-oriented methods which are in par­ticular related to experiences that have been digested well. It now becomes clear why experiences tend to grow in clusters. When particular situations have been explored many times and the experiences have been dealt with and digested well, the COEX-system is a positive one in which all kinds of new skills have been acquired which can often also be applied to other, related situations. Generally, in such an area of experience the individual is in a positive learning spiral. Experiences that are dealt with and processed badly, also tend to grow in clusters in a similar way; there is a fair chance that the next time the individual gets into the same, or a similar or related situation, he or she will have another problematic experience. This increases the probability of telic behaviour in similar situations, with the result that there will be less experimenting. In this way the individual will easily get into a negative learning spiral in a similar area of experience. New experiences are no longer used for learning but only intensify and extend the existing, relatively in­efficient behaviour. Figure 5.3: Safety margins in the telic state The dotted lines mark the safety margins in the telic state. The risky areas become larger, the safe areas (or refuges) smaller. In terms of figure 5.1 this means that, given such an accumulation of bad experiences, the cognitive representations of the refuges (+ +) will remain relatively restricted and small and for the cognitive represen­tation of the problematical areas (- -) there are relatively increasing and less efficient margins. In the case that there are no necessity-oriented methods of great precision and a high degree of abstraction, and thus relatively many methods are of the sufficiency type, the limits shown in figure 5.1 are less favourable in the telic state. The refuges of areas that are dealt with well will be limited, because the sufficiency-oriented methods are too much restricted, whereas for the areas that are dealt with badly, the safety margins are too large. Thus the individual has relatively little freedom of movement. In such a negative learning spiral a negative COEX-system will expand increasingly, owing to an accumulation of avoidance reactions which are primarily based on methods of suffi­ciency. They can be generated relatively quickly but they also involve relatively large safety margins, with the consequence that a relatively great part of the area of experience will be con­sidered as risky. It is extremely difficult to escape from such a negative learning spiral. A prerequisite for this is the ability to attain the relaxation, necessary for the digestion of the accumulated experiences. Should a number of ex­periences that have been dealt with and digested well, verge on an area that has been dealt with badly, they may sometimes serve as refuges, when situations become too frightening. This may then provide the required safety and rest. It is now possible to relate all this to Lazarus' theory as described in chapter 1. In our view, the appraisal of a par­ticular situation or transaction depends to a great extent on the metamotivational state of an individual. A transaction that is appraised as stressful will often be regarded as threatening in the telic state, whereas in the paratelic state it is more likely that the same transaction will be seen as a challenge. When a person is in a positive learning spiral in which positive COEX-systems are acquired and extended, and new experiences and skills are digested well, new situations are likely to be experienced as positive and regarded as challenges. That is, the individual has noticed that owing to of his or her arsenal of skills, he or she is very well capable to anticipate many kinds of situations and to get them under control. Not only is this a good basis for acquiring new skills but it also allows for relaxation and the conviction that novel situations can adequately be dealt with as well. However, in the case of a negative learning spiral in which negative COEX-systems expand and the individual gets trapped in his or her own inadequate behaviour, entirely new situations will rather be seen as threatening. This increases the likelihood that the individual will hold on more tenaciously to particular - inadequate - behavioural strategies, so that it becomes increasingly likely that he or she will fail again. This makes clear that it is very difficult to make a distinction between an appraisal of the situation itself (Lazarus: primary appraisal) and of one's own abilities to deal with that situation (secondary appraisal). These two aspects are strongly intertwined. The appraisal of a transaction always depends on previous experiences, on acquired skills, and on the meta­motivational state of an individual. We have shown that this state may (sometimes quickly) change. This is called reap­praisal; the original appraisal of the transaction changes. According to Lazarus, such a change is caused by feedback about changes in the transaction because of actions taken by the individual, or by reconsidering the nature of the transaction. We are now able to supplement Lazarus' ideas. In our view the appraisal of a transaction depends in a great extent on the metamotivational state of the individual at that moment. A change of this appraisal means that there has been a reversal to another state. Such a reversal may take place because of "contingency" (a particular event takes place) or because of "satiation" (because a person has been in one and the same state for a long time). The two causes mentioned by Lazarus can be cate­gorized under "contingency": the transac­tion changes as a result of actions taken by the individual and the changing situation forces a reversal, or the interpretation of the transaction changes because of cognitive processes (think­ing), which may also cause a reversal. Hence, our cognition-energy- learning model does not only supplement Lazarus' ideas, in this respect adding reversals through "satiation", but it also provides a description and an explanation of the dynamics of the underlying cognitive processes. Finally, we pinpoint and discuss a few systematic mistakes which can be made when a person cognitively processes information. Lewicka shows that the questions an individual asks, depend to a great extent on the appraisal of the possible outcome of a trans­action. In the telic state (or action control mode) the in­dividual tries at all costs to avoid unpleasant outcomes, and it then becomes very favourable and practical to have a necessity-oriented method available. If the outcome is pleasant, however, the realisation of that outcome is of primary impor­tance; "the way in which" becomes less important and a sufficiency-oriented method generally suffices. However, this does not apply to the paratelic (action-involvement) mode. Generally, an individual will tries as hard as possible to prevent disappointments (see chapter 4, table 4.2). In the case of an unpleasant outcome, a disappointment means that it has previously been predicted that a particular unpleasant result will not take place, but that it happens anyway. It is important for the individual to keep the probability of this type of mistake (type II, or "false negative") as low as possible. However, we know from logic and statistics that when the probability of one type of mistake is kept as low as possible, another type of mistake will necessarily occur more often. Thus, when the probability of a Type II-mistake is minimized, Type I-mistakes will occur more often. When a Type I-mistake, or "false positive", occurs, it is predicted that the result will be unpleasant, but this is not the case. It is now likely that this type of mistake will be taken less seriously than the previous one, because this means that there is a pleasant surprise. Therefore, relatively little attention will be paid to this. As a result, good luck is virtually ignored in a problematic area of experience whereas disappoint­ments are regarded as extremely important. This pattern of cognitive processing takes place in particular when there are mainly telic states with a (too) low frequency of paratelic states. Not only is attention then fixed on possible negative results, but the (too) low frequency of paratelic states produces an excess of methods of sufficiency, with relatively large safety margins around the areas to be avoided, and relative­ly narrow limits of areas of experience that are safe and digested well (also as a result of safety margins that are wider than is strictly see figure 5.3). As a result, this pattern of experiencing and processing results in a strong (and in a sense "uncontrolled") growth of negative COEX-systems which may possibly even affect the already existing, positive COEX-systems. Should this pattern continue, then the probability of telic avoidance reactions in the area of experience concerned will become higher and the probability of paratelic exploration lower and lower. In the end, even the slightest confrontation with the area of experience concerned, even when outsiders do not consider this as threatening, will be experienced as frightening, the consequence of which will be a continued and uncontrolled growth of the negative COEX-system. "In many neuroses we not only fail to observe the expected extinction of the uninforced "Conditoned Stimulus", but we find an incremental (enhancement) effect, such that the unreinforced Conditioned Stimulus actually produces more and more anxiety ("Conditioned Response") with each presentation of the Con­ditioned Stimulus. [...] In neuroses, [...] in the majority of cases there is some sort of insidious onset, without any single event that could be called "traumatic" even by lenient stan­dards." Paying too much attention to disappointments and virtually ignoring good luck is one of the reasons why the neurotic behaviour persists. Van der Molen (1983, 1984, 1985) gives another reason (see also chapter 3). He explains how in the proximity of a negative COEX-system, tension increases very easily, while it is exactly in these areas that there are very few "refuges" in the form of adequate strategies of behaviour which may be utilized to keep the tension under control. In the telic state this increased tension is experienced as extremely unpleasant. What is more, the limits of an area that has been digested badly are still rather vague owing to the fact that little or no exploration has occured. The area is not clearly defined and restricted, has rather "fuzzy" boundaries, and may easily increase in size which further increases the probability of unpleasant ex­periences. When we bear in mind that disappointments tend to receive more attention than the occurences of good luck, it is clear that one easily becomes trapped in a negative learning spiral in which neurotic behaviour is intensified, negative experiences accumulate and little is learned from positive experiences. Having integrated Aper's, Van der Molen's an Lewicka's studies we have been able to provide in this chapter an overall picture of the dynamics of our learning processes. Based on these various theories, a Cognition-Energy-Learning model has been developed in which the most essential aspects of the learning process are explained. First, the energy dependency of learning was discussed. The alternating preference for a high or a low level of arousal produces the motivation for two essential aspects of learning: on the one hand, the acquisition of novel and unfamiliar experiences, and on the other hand, reserving time and energy for the structuring and processing of this experience and information. The alternation of the telic and the paratelic states thus maintains the learning process. Experiences can be problematical or non-problematical. Depending on the metamotivational state a person is in, an area of experience can be experienced as pleasant and attractive, or as unpleasant. Problematical areas (that is to say, areas for which no adequate behavioural strategies have been developed) will be avoided as much as possible in the telic state: in the paratelic state, on the other hand, these areas can be a source of (pleasant) tension and thus be attractive for exploration. In this way the individual will be able to gain piecemeal experiences in areas that are (relatively) unfamiliar. Such experiences are a prerequisite for development to a higher level of organisation of the individual. Non-problematical areas of experience will not be sought in the paratelic state, as they do not provide any tension and are thus considered as "boring". However, in the telic state these areas are essential for relaxation. Only if a certain degree of rest is acquired regularly, will the individual will be able to digest his or her experiences optimally. In certain situations in which an ideal sequence of telic-paratelic reversals is impossible. When such situations last too long, this leads to a negative learning spiral in which the individual more often comes to dead stop as a result stereotyped and less efficient ways of reacting. It then becomes increasingly more likely then that the negative, problematical experiences in a particular area of experience will extend to other areas. For this reason we speak about the "contagiousness" of experiences. However, this contagiousness also applies to positive experiences that have been digested well and which are thus non-problematic­al. When an individual is in a positive learning spiral, he or she continuously acquires new skills which can also be applied in other areas of experience. In this way the likelyhood of positive experiences will generally increase. Contagiousness of the way in which learning experiences are processed, in the favourable and in the unfavourable sense, is applicable therefore in the first place in areas of experience that are functionally related. In the second place, the contagiousness is applicable in all areas of experience in their totality. Finally, we have discussed in this chapter how the be­havioural strategy a person chooses depends on the appraisal of the possible outcome. When the outcome is pleasant, an approach strategy will be applied in the telic state to ensure the outcome will be achieved as effectively as possible. When the outcome is unpleasant, a strategy of avoidance will generally be applied. However, negative outcomes form a source of possibly pleasant tension in the paratelic state which produces the motivation to explore them further. In this way more information can be gathered and optimally processed in the course of time so that the already existing (easily obtained) sufficiency oriented methods can increasingly be replaced by a necessity-oriented method (which is more difficult to generate). This enables the in­dividual to attain a higher level of cognitive organisation and efficiency and to function more effectively. However, should the ability to relax be absent (chronically), the person may become caught up in an accumulation of problematical experiences. This explains, for example, the often persistent growth of neuroses and phobias. The problem of the neurotic paradox, indicated by Eysenck, for example, can be easily explained when regarded from the point of view of our Cognition-Energy Learning model. The Cognition-Energy-Learning model discussed thus far describes, in the first place, the influence of the energy state of a person on his or her motivational state. That motivational state is governed by emotions. It further states that the sequence of motivational states has implica­tions for the way experiences are cognitively represented. Considering Csapinski's studies, we can expect that the majority of the experiences which are not directly interesting, are sedimented in a vague, slightly positive cognitive background. Only the expe­riences with an explicit emotional "color" are represented as areas that have been digested well or as problematical areas. The advantage of such systems of representation is that, as soon as there is a surplus of energy, a person can experiment in those areas which are registered as problematical. Those areas of experience are exactly the areas which can provide most new and relevant information. Both the way in which experiences are represented (in COEX-systems) and the gradual shifts in that representation are described, and, moreover, it is clarified, how a particular represe­ntation with concomitant proce­dural aspects (necess­ity- or sufficiency-oriented methods), leads to specific types of behaviour. However, all this still concerns a very rough classifi­cation into cognitive main categories. In fact it comes down to the difference between experiences that have been processed and digested well and ex­periences that have not been digested well, to the difference between ex­periencing this as pleasant and as un­pleasant and between combinations of these two opposites. The Cognitive-Energetic Learning model may also be supple­mented with the influence of the quality of social interactions on the dynamic state of the learning process. This can render a considerable extension and specification of the cognitive main categories mentioned. Moreover, such an extension enables us to make predictions about the way in which social interactions may influence the growth of a person because they interfere with the way energy is invested in the learning process. However, this extension lies beyond the confines this report and will be described in another report (see Maarsingh, 1990). In the next chapter we will give an example of the practical application of our Cog­nition-Energy-Learning model. In this chapter an illustration of the Cognition-Energy-Learning model will be given, based on experiences of teachers who have just started teaching (Romkes, 1988). This concerns exclusively inexperienced teachers who regard the learning process as problematical. The state of learning of the inexperienced teacher, apart from personality, is closely related to the extent to which he or she has been able to deal with previous experiences from educational learning situations (training) and to gain an adequate didactical behavioural repertoire. However, it is important that this repertoire of coping skills develops and and that it can be modified as soon as problems arise in the classroom. According to Vonk (1983), the problems of table 6.1 are encountered most frequent­ly. The problems mentioned in table 6.1 regularly produce a high level of arousal. A teacher will experience stress when this state of increased arousal lasts too long. The duration of stress depends on the didactical behavioural repertoire of a person. When this behavioural repertoire is inadequate, a person will be in a state of stress for a longer period of time. That is, it is difficult for such a person to achieve the phase of relaxation owing to the lack of well-controlled skills which are necessary for controlling stressful situations (see chapter 3). When such a situation (of stress) lasts too long and the stress experience is not digested well, a negative learning spiral may arise in which fear and avoidance behaviour accumulate (see chapter 5). "The class enters noisily. It is cold. The pupils are jumping up and down in order to become a little warmer. You walk into the classroom and try to have the children take their seats. But before you have managed to do so, you are rummaging in your bag. A few moments later the same happens again. You tell a pupil to sit down, but before he sits down you walk back. You are in the centre in front of the class and look into the classroom. In the meantime everyone has sat down. The pupils are still shouting. You walk towards Fred, a trouble­maker. You address a few pupils. It is becoming quieter now. "Will everyone take his books, please?" A number of pupils are shivering and making a noise. "I have marked the dictations and the results are very bad". They all laugh. "And what I further have to say about the dicta­tion....", the pupils are talking again now and you have to shout very loudly to make yourself heard. You wait some time and address a few pupils: "Mark, Martin" and finish with "Do not throw them away immediately". You give everyone their work back. Everyone is shouting. "Damn I have got a D". "I have a C". "Hurray, I have a B". "And what do you have?" There are many unsatisfactory marks, many of them are D's. The pupils are indignant. Some pupils walk to your desk to complain, but you do not listen and send everyone back. A girl, who is really indignant, is sitting in front of you. For not writing a hyphen and for not writing one word as one word, you have deducted two whole points. They think it ridiculous. There is so much noise, that you can hardly make yourself heard. "Yes", you scream and turn red. They keep on protesting loudly. It is an enormous mess. You walk towards your desk and sit down demon­stratively, as if you want to call it a day. "Can the ones with the insufficiency marks do the dictation again?". "No! ", you shout back. This example shows that this teacher does not command those types of behaviour (coping skills) which would make the situation more manageable for her. The result is that she tries to command respect. Managing the class and not being troubled by stress become main aim in all. This is shown by her preference for an authoritarian way of dealing with the class and her rigid attitute with regard to the educational responsibility. This behaviour implies an attitude in which achieving control of the situation is central. The teacher is now in the telic state. The way in which she (temporarily) achieves her goal, and is thus able to reduce her level of arousal, consists of showing aggressive or avoidance behaviour. Both agression and avoidance provide relaxation for a moment; when the teacher shouts, the class will be quiet for a moment and also when she adopts a reserved attitude and forgets her pedagogic responsibiliy for a moment, she experiences less stress for a short period of time. In both cases she has temporarily managed to get away from the threatening situation, but this situation is not controlled, in other words: she has not developed adequate coping skills. In the short term this avoidance behaviour is rewarding, but structurally the situation has not changed at all. As the teacher cannot relax sufficiently, her energy supply cannot easily be replenished. As a result she will be less often in the paratelic state, and in that case she will be unable to try the new, and (possibly) risky behaviour very frequently which could eventually lead to adopting useful new behavioural techniques and to acquiring new skills and flexibility. And it is precisely this lack of adequate skills which prevents her from controlling this situation. In such a situation there is a negative learning spiral in which behaviour becomes increasingly stereotyped and rigid (see chapter 3 and chapter 5). In such a spiral, more and more short-term solutions are found to deal with problematical situ­ations and new behaviour is not experimented with sufficient­ly. In such cases it is unlikely the behavioural repertoire will expand optimally. In a problematical teaching situation, two types of cognitive representation may arise (the remarks mentioned were reported in subsequent interviews). First: extreme and fixed negative thoughts about oneself: "I do not have sufficient command of the pro­fession", "I am not good at organizing", "I am not good at managing children", etc. Secondly: extreme and fixed negative thoughts concerning others: "The pupils are annoying", "The colleagues are not nice", etc. From interviews with inexperienced teachers with problems it appeared that the following types of bias in the cognitive and perceptive representation of the teaching situation may occur (Romkes 1988). First: generalisation, for example: 'all pupils are annoying'. This exemplifies that the teacher uses sufficient conditions, rather than necessary conditions at such a moment (see chapter 4); i.e. the teacher does not attempt to discover the exact cause of the problems, but is satisfied with simplistic and stereotyped rules of thumb. Secondly: deletion, for example when one's own role is left aside: "the pupils are so annoying". In the third place: transformation, when the teacher no longer notices the individual differences between pupils, and regards the class undifferentiated. These cognitive "mistakes" can also be described in terms of Lazarus' theory (see chapter 1). That is, problems with primary and secondary appraisal are concerned here and as a result a related lack of coping strategies. As far as the primary appraisal is concerned, the first instinctive appraisal of the situation is important. When the teacher is too tense in dealing with the situation, he or she will tend to use a rough and ready recipe, such as aggressive behaviour, when dealing with problems. As far as secondary appraisal is concerned - appraising one's own capac­ities - the inexperienced teacher can change his or her own role, or even it completely. It is now clear that unless the pupils do not change their behaviour, the situation will not improve unless the teacher behaves differently. According to our learning model this is only possible once she has sufficient energy surplus to reconsider the class situation and to experiment with other kinds of behaviour. In other words, the teacher has to develop other skills that enable herself to relax and/or she has to teach less frequently and to organize more breaks and time off for relax­ation and recovery. In this way she will be able to invest a surplus of energy in paratelic, and thus experimental and explorative behaviour. When a particular type of behaviour proves succesful, this can be integrated in the repertoire of skills already at her command. This may, for example, include taking the needs of pupils into account more often which may produce moments of relaxation during the lessons, both for teacher and pupils, and also time for explanations, questions, etc. For example, the supervisor could instruct the teacher to pay less attention to the pupils' command of the language, and to pay more attention to topics not directly related to the subject. This could involve conversations about experiences in the weekend, for example. Such behaviour can be rewarded in the form of good teamwork with the pupils which in turn can provide relaxation (and thus energy) for both the teacher and the pupils. As a result both teacher and pupils will be able to manifest paratelic behaviour and hence will be able to experiment in order to find the best way of teaching, and of being taught. The phase of relaxation is extremely important for replenishing energy supplies and for the integration of ex­periences. It is essential that the inexperienced teacher has enough moments of relaxation during, or after work, if paratelic or explorative behaviour is to be frequently manifested. According to the learning model only through a regular alternation of the telic and the paratelic states can an adequate didactic be­havioural repertoire develop. There is a positive learning spiral (see also 3.3) when behaviour of control and manipula­tion (telic) and behaviour relating to challenges and explora­tion (paratelic), alternate. The telic state aims at achieving goals (for example to teach from a particular chapter). In the paratelic state there is space to handle the pupils different­ly and to try out novel approaches. When the teacher is alternately in the telic state and the paratelic state, he or she is able to gain experiences which are necessary in order to discover and elucidate the necessary conditions for negative incidents, so that the next time these incidents can be avoided or solved more easily the next time (see chapter 4 and chapter 5). On a proximal level, paratelic behaviour uses up large amounts of energy, but the ultimal result is that it saves energy. The inexperienced teacher is then able to develop more adequate coping strategies which enable him or her to be in a state of relaxation more regularly. This makes it possible for him or her to replenish the energy supply more often and more thoroughly. Romkes (1988) has shown that successful teachers are not always aware of the coping strategies they use. This is not surprising when you realise that it is not necessary desirable to act consciously or to seek the necessary conditions for negative incidents consciously as long as the teaching responsi­bility is met satisfactorily. If the learning process proceeds well, much of the experience and information needed for a further expansion and refinement of the behavioural repertoire is collected unvoluntarily and automatically. From this illustration it may be clear that the Cognition-Energy-Learning model can be applied well to situations such as teaching. The model provides insight into the way in which in­experienced teachers can become trapped in a negative learning spiral when there are too few moments of relaxation. This implies that in teaching situations, less attention should be paid to teaching the content of the subject as thoroughly as possible by drumming it in repeatedly, and that more attention should be paid to finding ways of achieving enough moments of relaxation for both teacher and pupils. This relaxation is essential for replenishing the energy supply, and it is the surplus of energy that allows experimental and ex­plorative behaviour in manifest. Such behaviour brings a flexible attitude towards the teaching situation with it. This flexi­bility enables the teacher to discover which teachingstrategy (at which moment) is the most satisfactory and effective.